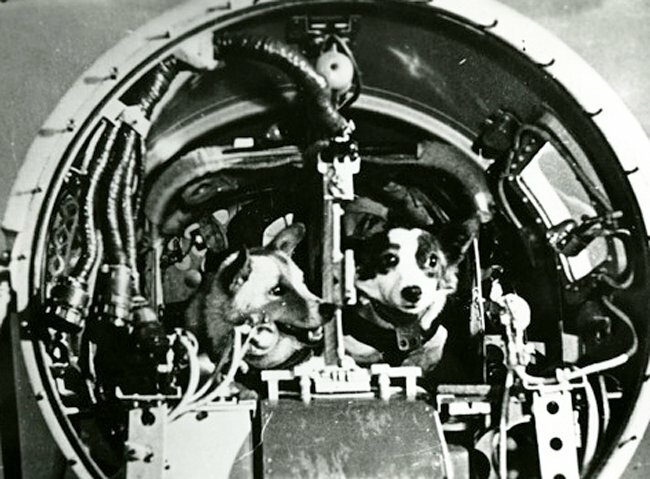 In August 1960, Soviet dogs Belka and Strelka1 - accompanied by several mice - became the first animals to travel into space and return alive. Packed into their Vostok spacecraft, the space canines relied on some venerable technology to return to terra firma - technology which is still today ensuring a survivable, if not always soft, landing. 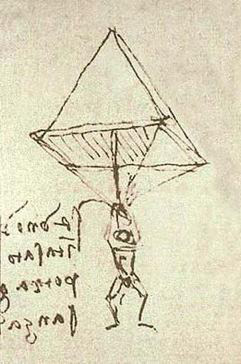 The concept of the modern parachute first pops up in Renaissance Europe, with Leonardo da Vinci's famous sketch of c.1485 showing just how a man might float to Earth without doing himself some serious damage. It wasn't until 1783 that Frenchman Louis-Sébastien Lenormand jumped from the tower of Montpellier observatory and lived both to tell the tale and invent the word "parachute". It was thanks to the pioneering Lenormand, and continuous improvements to the parachute over the next 180 years, that Belka and Strelka walked away from their post-reentry fall from the skies, and paved the way for Yuri Gagarin's historic 1961 flight. Instead, scientists configured the Vostok's centre of gravity so the capsule would some have degree of predicable attitude. 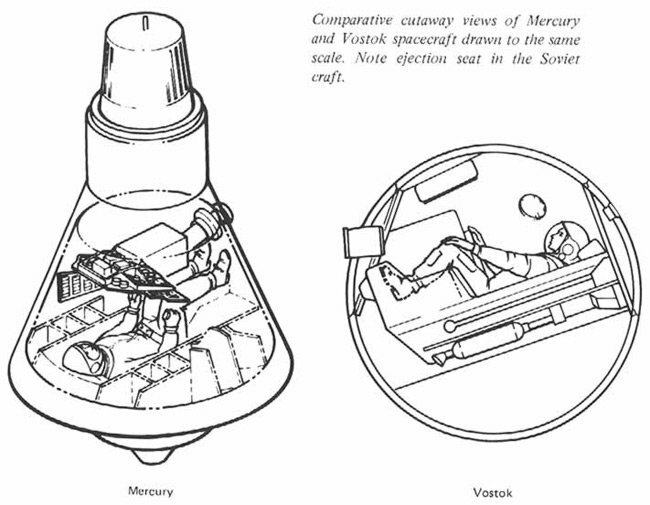 This was essential for manned missions because, amid concerns about the Vostok's landing velocity (for humans at least), even when slowed by its own parachute, it was decided that cosmonauts would be ejected from the capsule at some 7,000m to float independently groundwards. Fortunately for Gagarin, his Vostok 3KA-3 was in the right orientation when the hatch was blown off explosively and he was projected into the atmosphere. Just one month after Gagarin's flight, Alan Shepard became the first American in space with the suborbital flight of his Freedom 7 Mercury capsule. 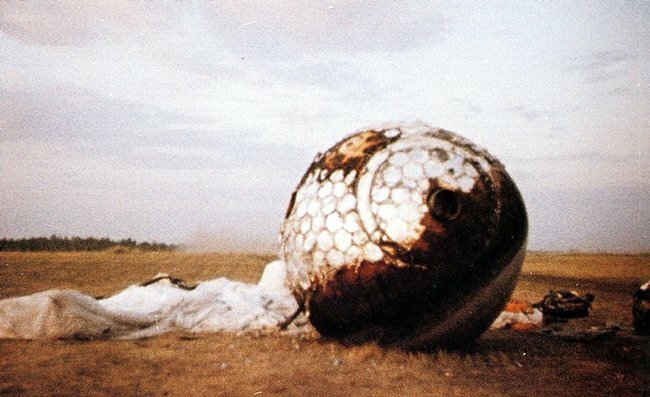 The mission demonstrated two marked differences to the Soviet approach: the use of a truncated cone capsule; and a preference for splashdown over hitting the ground with a bump. For the US, the vast Pacific off its western coast, and its long Atlantic seaboard, coupled to a sizeable Navy fleet including aircraft carriers, made the ocean a perfect landing site. The Soviets, lacking both carriers and suitable neighbouring stretches of sea, opted instead for the spacious land interior of their empire. 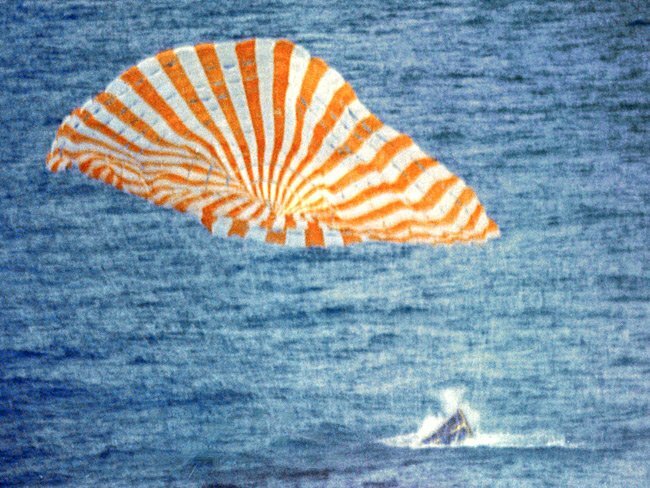 Mercury featured an inflatable landing-bag system situated behind the heat shield, which deployed just before splashdown to absorb some of the force as the capsule came down vertically. It also had additional bags to keep the vehicle upright in the water. Nonetheless, a couple of months after Shepard hit the heights, the US splashdown policy almost cost Liberty Bell 7 pilot Gus Grissom his life. Following a 15-minute suborbital flight and descent, the capsule's hatch blew off unexpectedly, obliging the astronaut to make a quick exit. 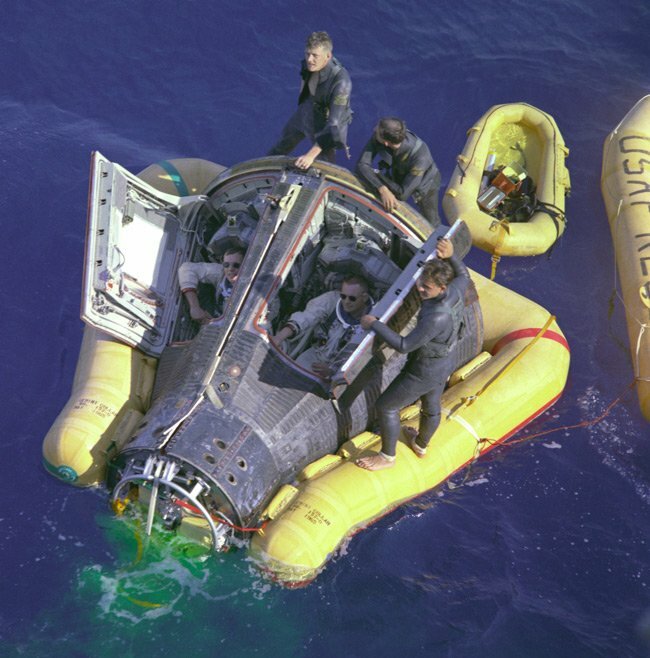 Grissom almost drowned as his spacesuit filled with water, and the Liberty Bell 7 sank to the bottom of the briny. 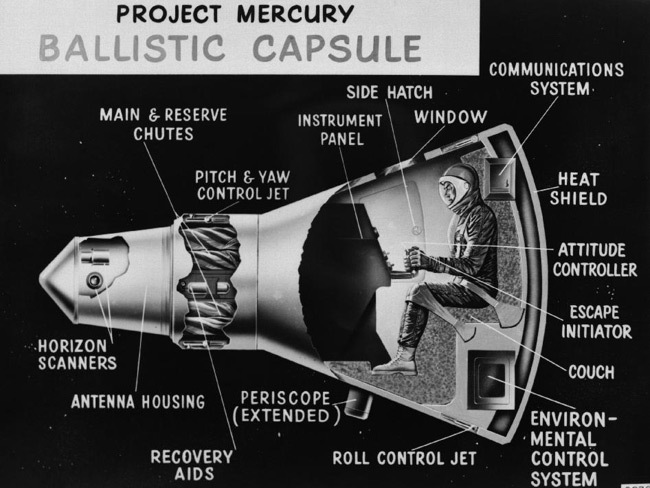 Near misses aside, the Mercury's conical capsule, with its ablative heat shielding on the blunt end, facing the direction of reentry, proved an effective design. Why chase balloons for hundreds of miles when you can drop the payload outside? There's no way this could go horribly, violently wrong... right? Hey Cortana, where's your VP?